The Museum of the San Fernando Valley: HOW MANY KNOW WHERE THIS MOTION PICTURE STUDIO IS TODAY? HOW MANY KNOW WHERE THIS MOTION PICTURE STUDIO IS TODAY? When Gary Fredburg first donated this postcard, I assumed it was a duplicate of a vintage card of Warner Brothers Studios in The Museum's archives. Something seemed odd about the card, so I checked our Burbank files, made a comparison discovery that narrows the year of the postcard and reveals a little evidence of San Fernando Valley history............ Can you guess what it is? You guessed right! 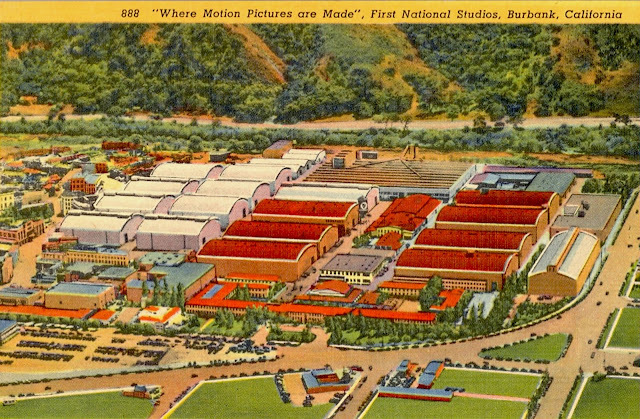 The card is of First National Studios in Burbank. These studios were absorbed by Warner Brothers in July of 1936.